Phil makes some excellent points (athough I think he really mean 991.1 GTS ). I went into my OPC intending to but a 981 Cayman and was disappointed - don’t even get me started on the 718. I ended up going for a 991.1 because it was so much better. For an additional £15K its definately worth it. Interesting that so many people think that it has to be a 911. I believe the 968, when it was released was actually quicker around the Nurburgring than the same year 911. Didn’t stop the 968 being dismissed by 911 owners as “not a real Porsche, engine in the wrong place.” Seems the Cayman suffers the same snobbery? You are right to some extent, but do not think it is actually "snobbery". The 911 has 50+ years of design evolution and racing heritage, so owners are buying into this provenance as much as the outright performance. There is really no other model range in the world that has a such a long and illustrious DNA thread. The Porsche marketeers know this and have always charged a premium price for it. I have no experience of a Cayman or a Boxster so am only querying whether this perceived inferiority is expressed by 911 owners. Unless it is forced upon me by no-one actually buying it, keeping my Turbo is not an option I'm considering. Over the last few weeks I've viewed several 991s (3.4s and 3.8s) that could be bought for £55k and have concluded that for that money I'd have to an 'S'. Unfortunately none of those I've seen have been the right car for me so I'm left with the choice of stretching the budget a little or waiting a bit longer. In the current market the latter option is the decision I've made. However, in the meantime, I stumbled across a Cayman S that is really testing my 'fantastic sports car but it's not a 911' resolve to the limit. The car in question is in a very rare colour combination and highly spec'd but more importantly it's a year newer, lower mileage and £14k cheaper than any 991 I've viewed. Sitting behind the wheel it didn't feel any different to a 991 and when I took it for a cross-country drive I certainly wouldn't have got back any faster in any other car. My conclusion is that for £40k a 2013 Cayman S is a very viable alternative to a 2012 991 that would cost around £55k or an equivalent 991S that would cost nearer to £60k. The internal conflict I'm currently wrestling with is whether to leave a Porsche shaped gap in my life for a while or to go back and buy the beautiful 'jump in and drive' sports car as a 6-12 month 'stop-gap'. whether to leave a Porsche shaped gap in my life for a while or to go back and buy the beautiful 'jump in and drive' sports car as a 6-12 month 'stop-gap'. +1 for the stop gap... Have some fun... You live once, right? And really do you care what others think about it not being a 911 in the same way as a 911 isnt a veyron theres always others opinions and always something better unless you have 2mill for a car ,I am also not convinsed that a well set up cayman with a remap and upgraded engine mounts, mapped PDK etc wouldn't actually be faster round a track than a 991.1 3.8 in stock form. Sapphire Blue, for example, Phil? I quite fancy the idea of an E92 M3 for Mrs P in the future, what are your view on Mcars? For 6 months or not a bad call surely? I had a 2013 E92 M3.. it was fun for a while, engine is epic but it’s not a Porsche. I prefer my 996, it just feels more special. M3 will leave non GT 996 and 997’s on track.. they’re very fast but a bit boring at normal speeds. I found myself changing gears when I didn’t need to create drama! T8, I drove a 991 RS from Stuttgart to Milan and back in May this year. Did a pass or two, some autobahn (managed 175MPH )... it was incredible. What a car. If I lived in Germany I’d pay the extra and go 991s, it’s worth it. BUT, we live in England that’s becoming more and more frustrating. There’s even talk of dashcam grassers being able to download onto a website for the Police to use against us. As you said, the Cayman feels very similar. They’re in fact brilliantly designed and a joy at any speed. I’ve just had my first weekend with one and love it as as much as I love the 991 RS. Unbelievable value for money. 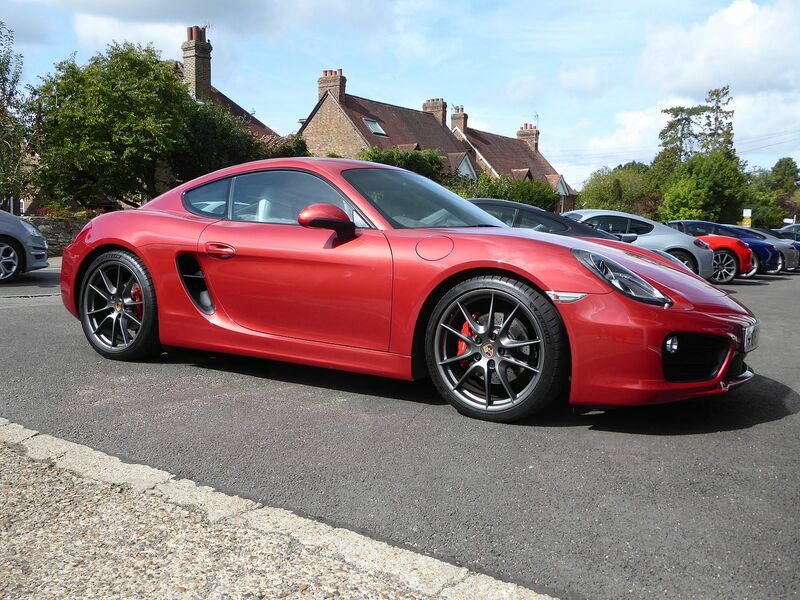 If you’re not bothered about that extra bit of performance why not give the 981 Cayman a go?! I could have bought a 30k Mile leggy GT3 but have bought a GT4 that you’d honestly struggle to tell isn’t brand new. It gleams and that in itself is hugely satisfying. The cockpit is essentially the same and handling at all speeds fab. Im kicking myself for not string a standard S instead of my old M3.. that was a missed opportunity. Get one and then trade it in against a 991 when they eventually dip in the next 18 months...??!! It's a tough one. I tend to agree that from a pure fun and driving feedback I'd be going for something with two seats and midengined. Then there is iconic 911 thing that just grabs people. All rounder it's the 911 but if it's for pure driving fun I'd be going Cayman. In fact I think the Gt4 is the nicest well proportioned car they have built in a long time. Buy a cayman with modest miles on the clock. Not going to depreciate too much from £40k ? You might even keep for longer than a year, for fuller impact of 992 on used 991 prices/availability to filter through . Unfortunately you can’t win on a short term own, then sell again trade in. I should know it would need to be buy cheap private? But buying and selling privately especially in the Porsche world is a nightmare. We must have spent too much time together as my latest thinking is exactly that. With the uncertainty about what motoring to Europe might be like next year taking the opportunity to plan a few UK trips has never been more right. .......... I stumbled across a Cayman S that is really testing my 'fantastic sports car but it's not a 911' resolve to the limit. The car in question is in a very rare colour combination and highly spec'd but more importantly it's a year newer, lower mileage and £14k cheaper than any 991 I've viewed. This was the 981S I stumbled across whilst looking for a 991S. I left it at 12 noon on Saturday and, after much deliberation, rang up to buy it this morning only to find that it sold at 12.30 to someone who'd been waiting patiently for me to say yes or no. I'm far more disappointed than I ever thought I would be but that's all down to missing that specific car. The fact that I deliberated so long over such a brilliant example of a Cayman S confirms to me, once-and-for-all, that my next Porsche will definitely be a 991.